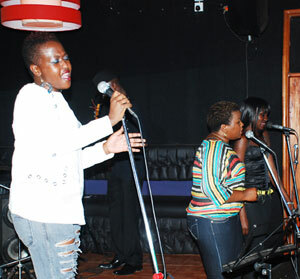 When they won the Coca-Cola pop star competition back in 2004, Lillian Mbabazi, Jackie Chandiru and Cinderella Sanyu, who initially made up the group Blu3, promised to be the hottest thing on the Ugandan music scene within five years. It actually took them just three years to do that, because by the time they launched their second album Burn in 2007 they were the hottest girl group in the country. But there was one thing that Coca-Cola had not taught them – how to handle stardom. Soon the baggage that comes with a celebrity status came crumbling down on them as Cindy left the group acrimoniously in 2008. Edith Bagenda a.k.a Mya was brought in but she found Cindy’s shoes too big to fill. In 2010, the remaining girls in Blu3 took on solo careers, save for lip-syncing Mya who chose to focus on family. Wise choice. Cindy’s and Jackie’s solo efforts yielded fruit early as they topped charts last year. Lillian, on the other hand was pregnant, but as soon as she dropped the tot, she set off to catch up with her former colleagues. Some fans thought she would not juggle motherhood, singing and cat fights with the numerous girls that give Goodlyfe singer Mowzey Radio – the father of her child – attention. But with her philosophy of “to be a star, you must shine your own light, follow your own path and never worry about the darkness”, Lillian decided to do something different from what her former allies had done. She started her own band, The Sundowners at the start of this year. “We do everything from the evening when the sun is down, even practice. We are not like other bands which practise during the day,” she says. With established artistes such as Harry Lwanga formerly with Afrigo band and Martha Musinguzi from Liberty Worship Centre, the band was up and running in a month. Last Friday they had their fourth outing at the new Club Le Bejoulaise. Everyone was eager for the show because the earlier advertisements had announced that Lillian would be sharing the stage with Richy, a little known but talented R&B artiste; but above all, fans wanted to see what Lillian had been cooking. Unfortunately, Richy wasn’t able to show up; Keko had to fill in for him and she did a good job. At 9pm Lillian hit the floor and going by the way her body has toned, it is hard to tell that she gave birth eight months ago. Though she hasn’t come up with a name for her new album yet, the songs are great and will compete favourably on the local music scene. So in love and Brown Skill are good R&B songs,Ye Gwe Weka and Kankutwale still need some panel beating before they rock Kampala. Because she has few songs, she patched up the show with renditions of Alicia Keys’ Diary, Bob Marley’s Redemption Song, Brenda Fassi’s Vuli Ndlela and some Tina Turner classics. She took a break to catch her breath and also greet the Goodlfye boys who were in the crowd cheering her on. Lillian, whose son is called Asante – Swahili for thank you – told The Observer she chose the name because, “the baby wasn’t planned for but I am more than grateful that it came”. She said she doesn’t stay with Radio and Weasel as the tabloids state but stays alone in Buziga. To her, “moving in is a big step in a relationship; I will do that with time”. She also rubbished the rumours of Radio not taking care of his child, saying, “we are both strong-headed adults and he is a very loving father who takes care of all his responsibilities.” The fact that he was there to support her project seemed to rubber-stamp her statement. Contrary to what people say, Lillian is not fazed by the many girls rumoured to be in Radio’s life. Her work schedule also gives her ample time to spend with her son. Lillian, who presents the Mid Morning Magazine at Radio City from 10am to midday, says she rushes home after the show, to be with her son. Like other players in the group, she too insists that Blu3 is still alive, although they haven’t performed or recorded together in years. In fact, industry critics say the girls are hanging onto Blu3 for dear life, because they realize they can never be successful without the Blu3 tag. Lillian differs: “We just decided to go solo and see how it goes; otherwise, we are planning a mega reunion”. How do they plan to do that? “It will ruin the surprise,” she says. The show was still in the meantime. And if last year was Kenzo’s year, 2011 is Keko’s. When she performed Cry For Help, those who thought she only raps were shocked. The best is saved for last and; so, Lillian’s Kawa, which had the crowd on their feet, came in at the climax and Vitamin summed up a successful night.